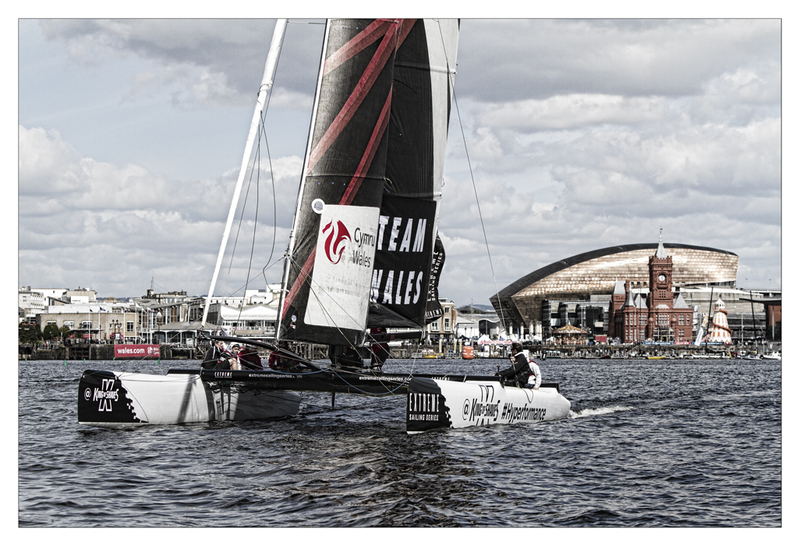 At the end of August we were able to get to Cardiff Bay to meet up with and photograph the totally mental guys involved with this sport of Extreme 40’s Sailing. For those of you who don’t know what it is then think British Touring Car Racing on water. Some have likened it to F1 but I think it has a better association with Touring Cars. Why? Well because the crews on these massive 40ft Catamarans are obviously all nutters, the racing is CLOSE, and when you are on the water with them, you realise that they do this for real. There is no quarter given or asked. They compete – and hard – for every place they can get. 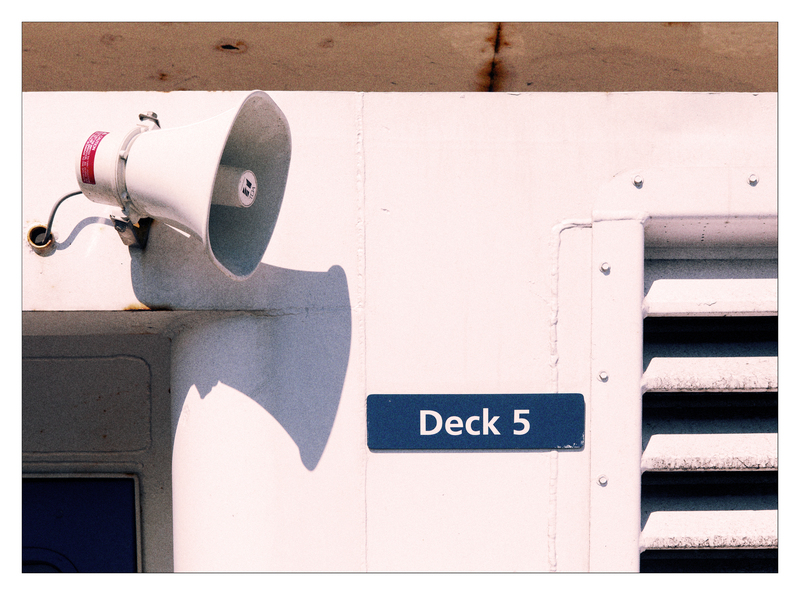 They shout at each other and this often relapses into profanities between crews as well as at any Marshall that may adjudicate during the race that they might have crossed over a thin line of etiquette (or ruling) meaning an instant penalty and loss of position. It is hard, brutal and spectacular. Hulls are often seen out of the water, indeed, it is advantageous as there is less drag and means you are catching the full force of available wind. 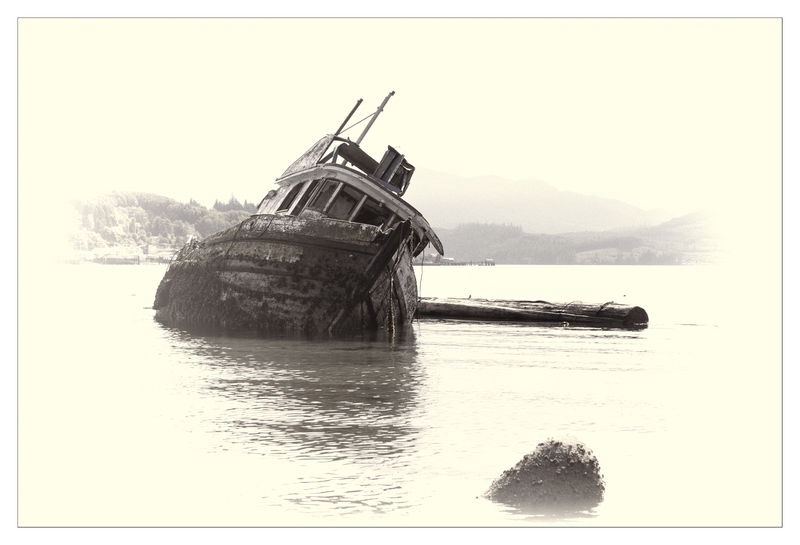 However, push too far and you and your team mates will be clinging for grim death to the flimsy netting that spans the two hulls as the whole boat flips over. Other dangers prevail too, too much wind behind and the noses dig in and the back flips over your head, and these boats are BIG. Courses are deliberately tight and in enclosed spaces for the public to gain maximum viewing, with plenty of turns marked by bouys or markers, these can get very congested at times and as teams fight for position, contact is sometimes inevitable. 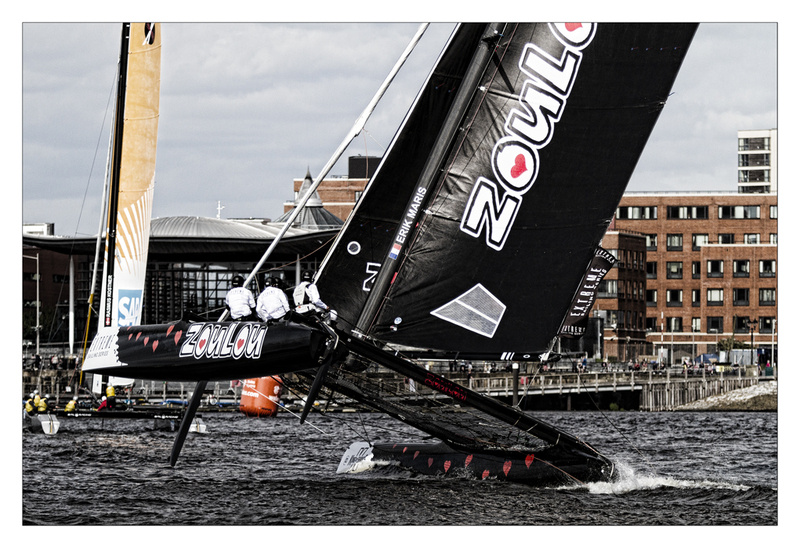 However crazy these racers are, as in the top echelons of motorsport, these sailors are extremely skillful. They always race on the edge but have lightning quick reflexes and an unerring ability to read the conditions to get the maximum speed and position for their craft. They all have many years experience under their belts and seriously know what they are doing. The teams compete in a series of meets or ‘Acts’ in 8 different countries and the beauty of the whole show is that as it rolls into town, they are very keen to get as many people involved as possible. Practice sessions see the boats full of everyday folk keen to see what this form of sailing is like. 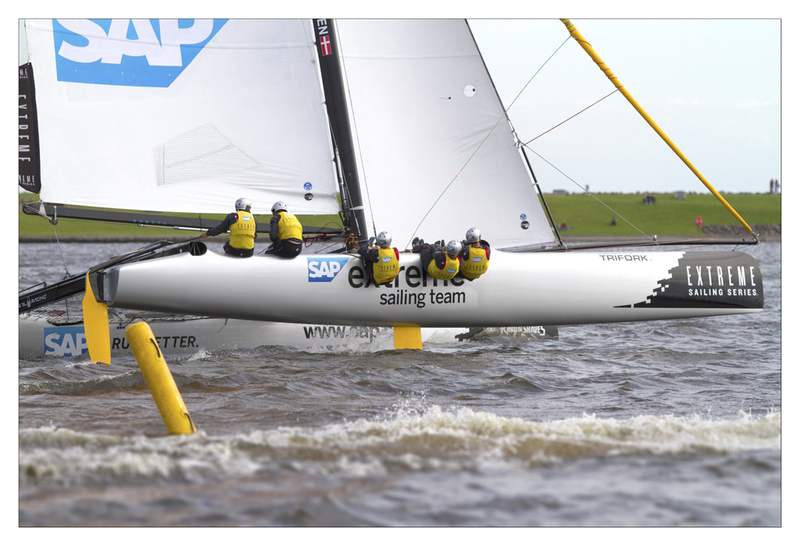 Few come back unimpressed having been hanging out of a boat, 20 feet in the air, reaching speeds in excess of 30 mph! The action is fast, furious and close up. 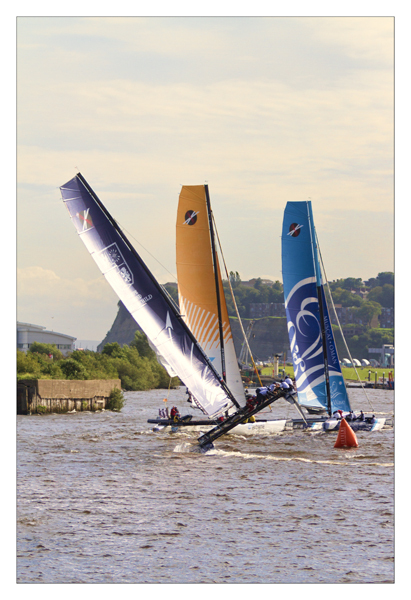 As in these shots, the racing never leaves the confines of Cardiff Bay meaning the public can follow the racing as closely as the teams themselves. 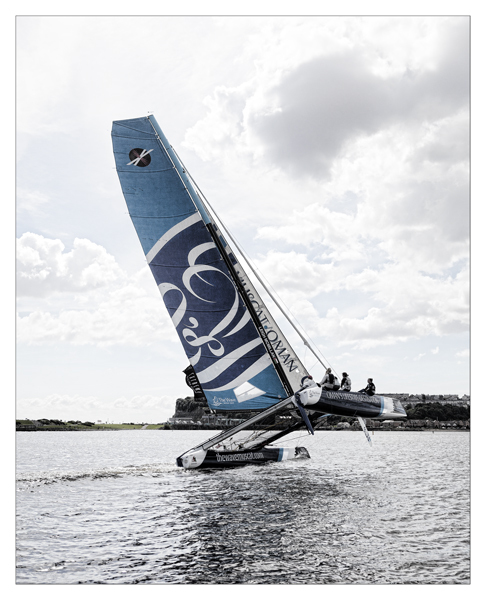 Unique for sailing. Each ‘race’ lasts around 10 minutes with several races taking place per session over several days per country. Each placement is therefore key to each team to calculate the overall winner of the meet and the overall series positions. 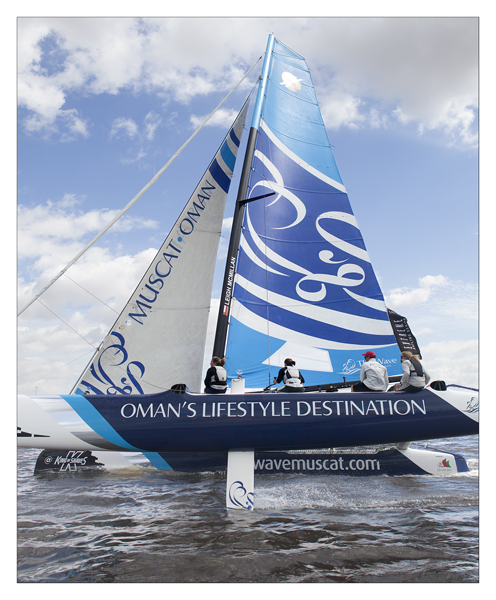 Consistency is therefore the watch word as in many sailing events. The racing is so close that at times, when we were photographing out on the water, in the middle of this apparent chaos that not only I was wincing and shuddering, but my battle hardened RIB pilots too! We were sitting and waiting for a seemingly inevitable ‘crunch and splinter’ as two or three boats collided, however, this amazingly rarely occurs as much as it looks like it should do. Later on in the day I moved to shoot amongst the crowd of amazed supporters and I quickly got to feel that this exciting form of racing is hopefully here to stay as young and old alike marvelled at the closeness of the action and the spectacular ‘flying hulls’. I for one, can’t wait for next year and hope to get photographically involved in some way over the closed season. Keep safe guys and continue thrilling us all!! Our Canadian road trip continued from Vancouver Island over to the mainland, through Vancouver itself and then up on the ‘5’ through Hope, Merritt and onto Kamloops. From there we headed for Jasper and were lucky enough to capture a few sights of the local Wildlife. The first image of an Elk was taken by chance as many of these things are. We were attracted to a couple of cars ‘parked’ at the roadside that were in fact watching a Caribou that was no longer in sight. 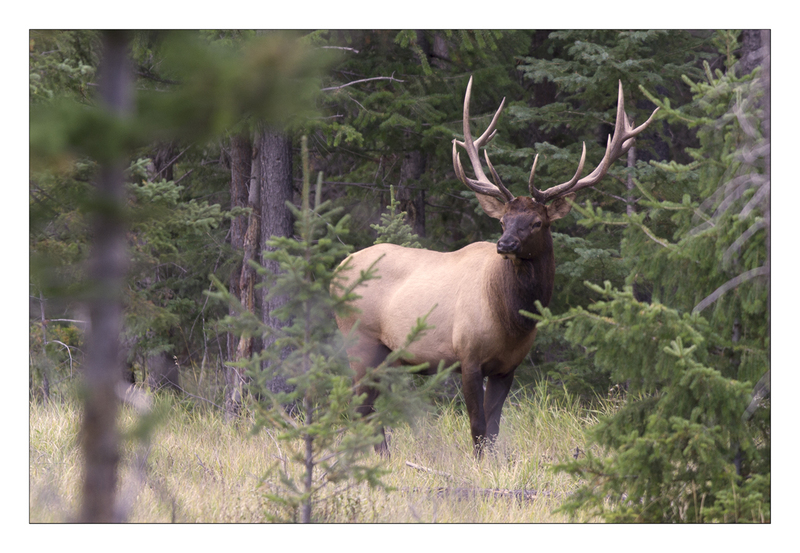 We glanced on the opposite side of the road and happened to spot this fine Elk in the woods. I took this with a 400mm on the crop sensored 7D making the overall focal length 640mm. The image was shot at f2.8 due to the lack of light amongst the trees and an iso of 200 and a shutter speed of 1/400th. 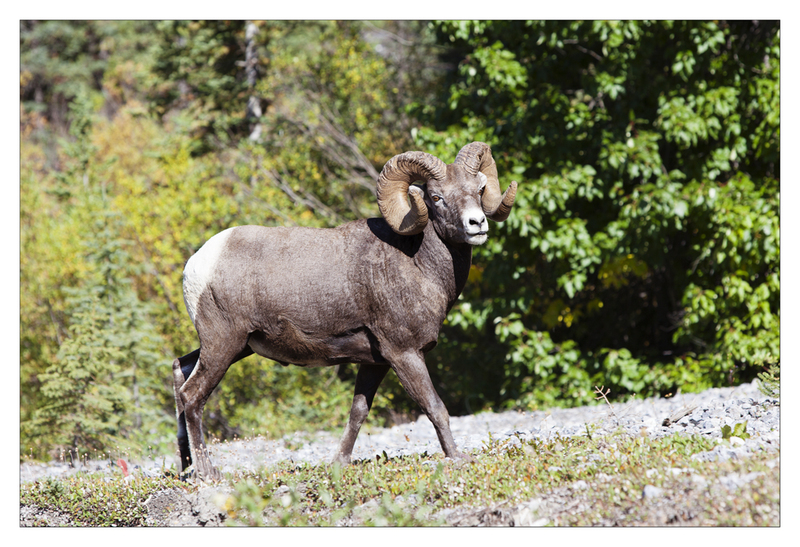 The image of the Big Horned Sheep Ram was taken with a 70-200mm on a 5D Mark ii at iso 100, f5.6 at 1/250th of a second. The latter image was captured on the Icefield Parkway at the ‘Weeping Wall’ where the ram was leading his troupe of three ewes away from a large crowd of people clamouring for shots of these slightly skittish beasts. 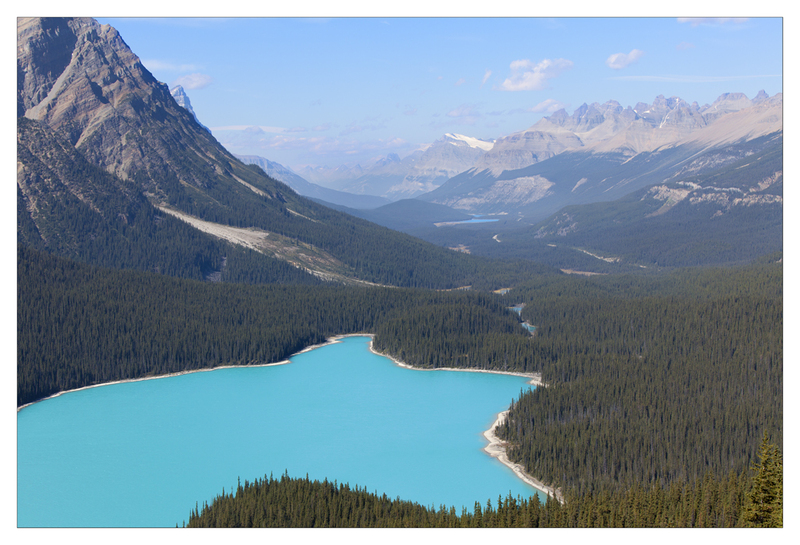 The image of the bright blue Peyto Lake was shot from the Bow summit and demonstrates the fantastic colour that is formed by limestone deposits in the water reflecting only the blue and green light from the sun. I particularly like this shot as the valley exposes further glimpses of the water further on down the river leading from the lake itself. 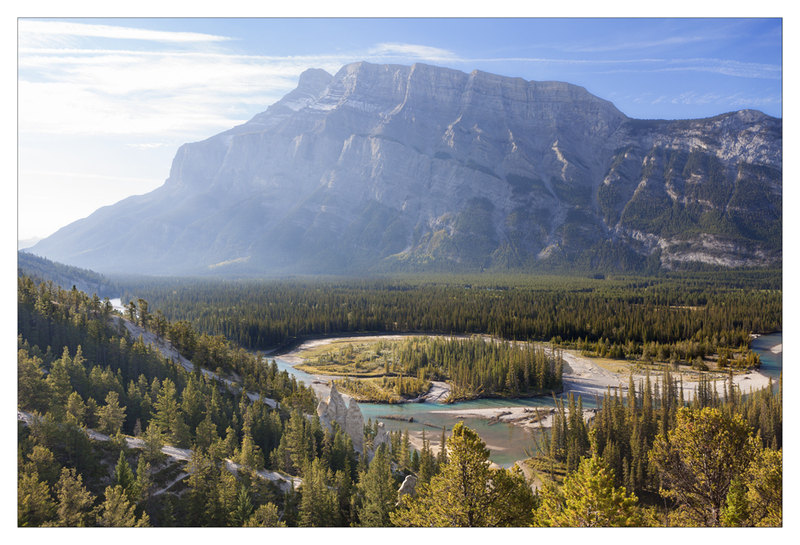 We continued to explore around the Banff National Park grabbing images as we went. 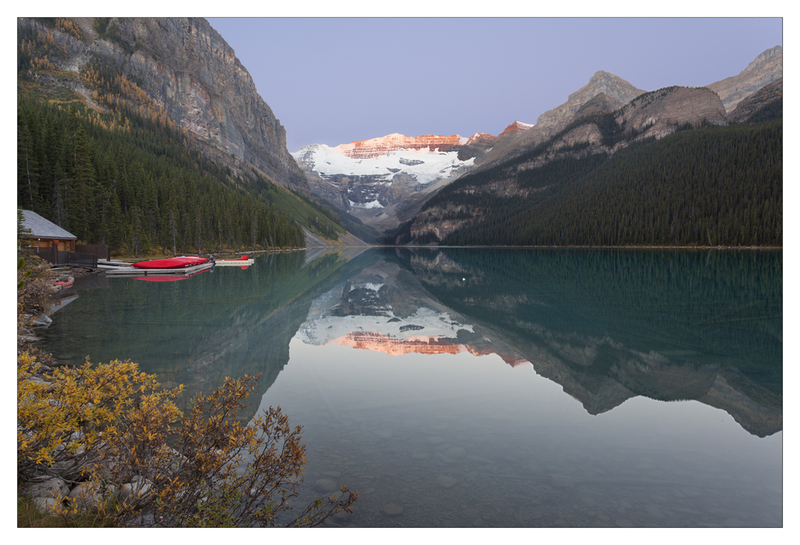 The iconic Lake Louise, Emerald Lake and Moraine Lake are all featured here and truly are as stunning in real life with their colour and the massive scale of the mountainous terrain around them. 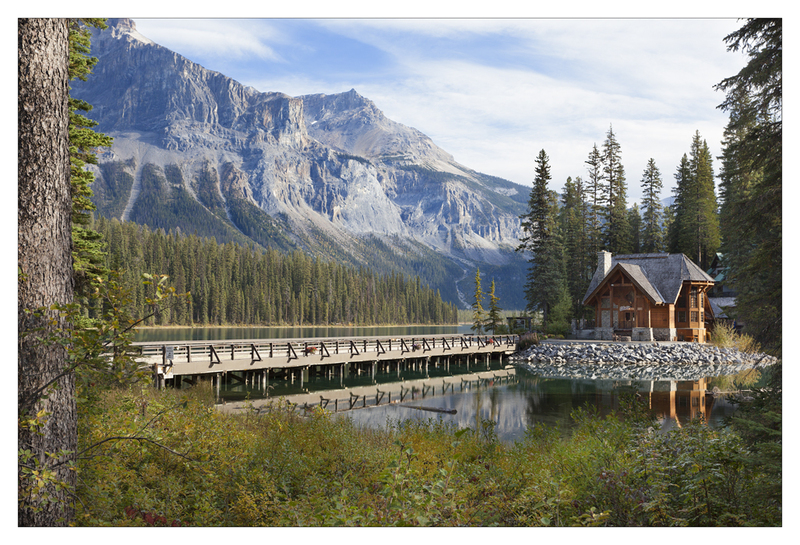 The images at both Louise and Moraine were captured at sunrise and the Emerald Lake image just after sunrise in early morning. Whilst these areas are extremely well photographed one is always tempted to try to better those seen before and maybe shoot from a different viewpoint. Indeed, at Louise, there were many other photographers around at dawn, some more serious than others but all were shooting from a different viewpoint although it was noticeable how many seemed to crowd around the more serious looking image makers as time went on! 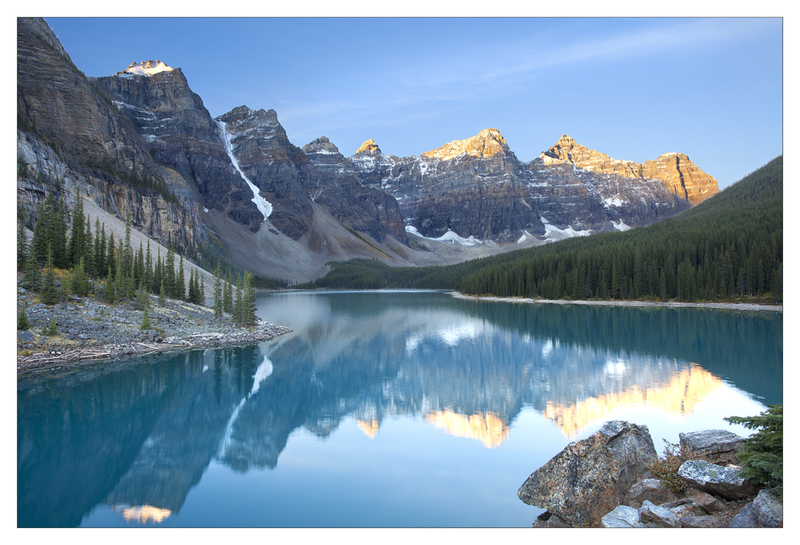 To say that this whole area of Canada is a photographers dream is an understatement of the highest order. It is one of those places in the world where you could spend a lifetime (as indeed many have) and never do it full justice. There is literally something there for everyone. Our day to day work being advertising shoots and marketing images leaves me thinking that there is so much potential here that it would be difficult to know where to start. However, anyone wanting some slightly better insider information regarding location shoots can obviously contact me for further details. 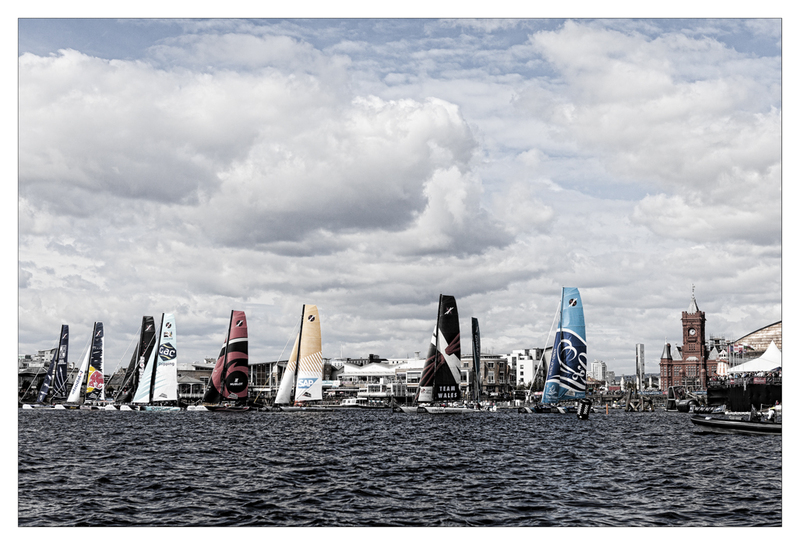 In the meantime I hope you have enjoyed this little update and keep checking back as we are due to post details of the Extreme 40 Sailing Series we shot in Cardiff with some very different processing techniques! 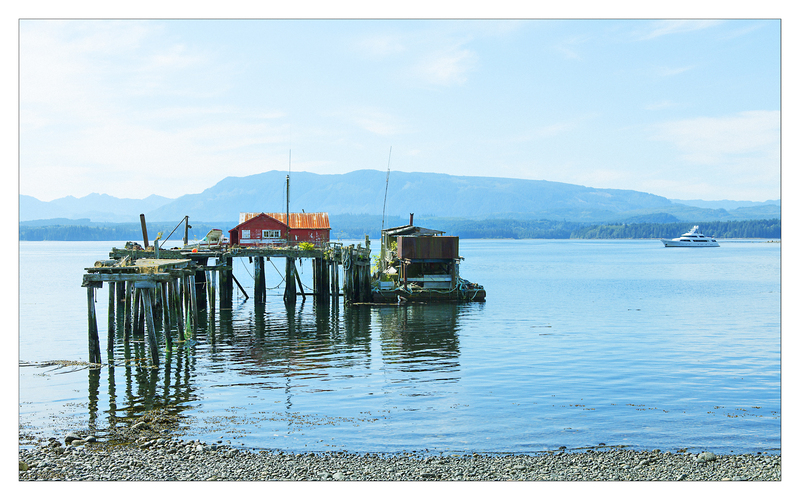 For many years there has been a real hunger to visit Canada’s West Coast and all it has to offer. Some great weather, stunning scenery all around and interesting nature and wildlife. Well, we have been quiet here at Squash due mainly to the fact that in September, I took three weeks out of my year to visit and fulfil my many years hankering! We split the trip into two main parts. One was to explore and navigate the Island of Vancouver, the main subject of this blog, and the other to road trip through the Rockies exploring what it has to offer photographically and otherwise. We landed in Vancouver and spent only one night in what seemed to be a beautiful and easy going City. Time didn’t really allow a longer stop over here but it would have been well worth a longer stay if we could. However, our break wasn’t to be a City one so we immediately headed out to the Port of Tsawwassen for the Ferry across to the Island. The next day we were off again embarking on a road trip that would take us all over the island to see many different sights. First stop was Sooke and around the south west coast which was on its own quite beautiful. Next on the trip was to head across the island again and head for Tofino and Ucluelet where we were to spend a wonderful two nights in beautiful surroundings. 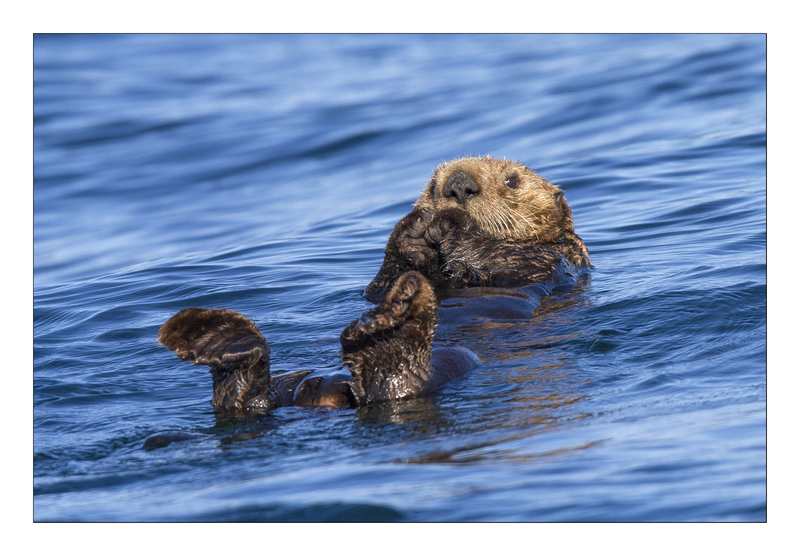 We came here to do a spot of whale watching and we saw not only whales but otters as well which was a real bonus to us. We were on a 12 seater RIB and I decided to take out the weighty and cumbersome 400mm f2.8 on a 1.6x crop Canon 7D. 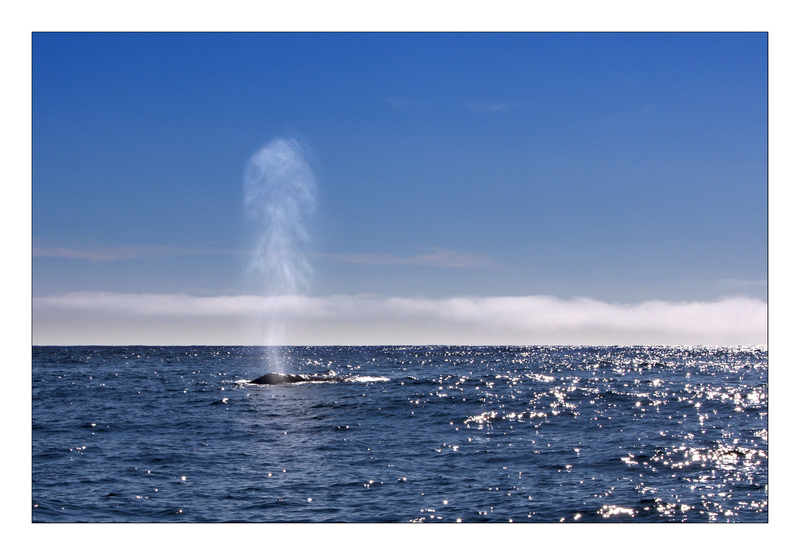 The first time we were out in the open waters of the pacific and I think I managed to shoot waves and coastline but really not much in the way of Whales despite seeing both Grays and Transient Killers. The second day I fared much better, we were still on a very ‘rocking’ RIB but this time we were sheltered from the tidal flows by the islands and rocks as we cruised the inlets south of Ucluelet. Using the big lens was a lot easier and much more stable. The experience was a first for us and one we would want to repeat as many times as we could. 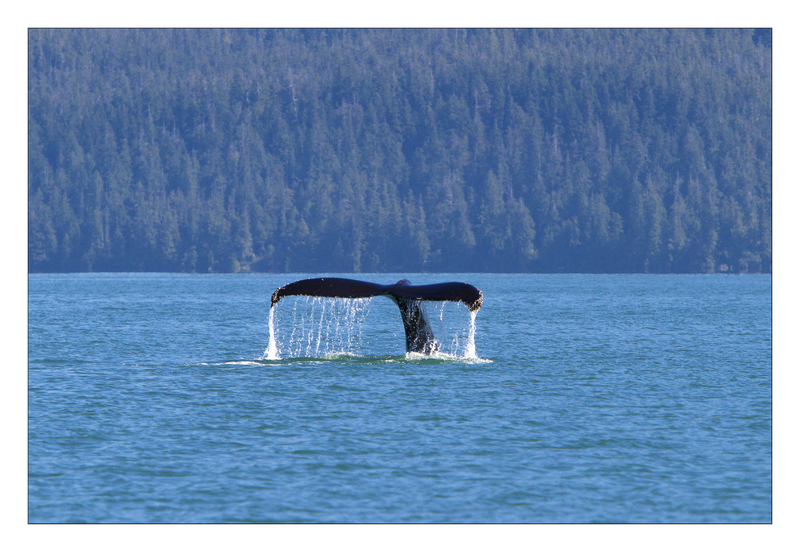 We convinced ourselves later on in the trip that it was worth the expense and were to have the chance to photograph and see more whales when we visited the north west of the island, at Telegraph Cove. We continued back across the island to enable us to continue north up the island along the west coast. The scenery at times was spectacular and the few lodges and cabins we stayed in along the way made the effort of travelling all the way up more relaxed and enjoyable. 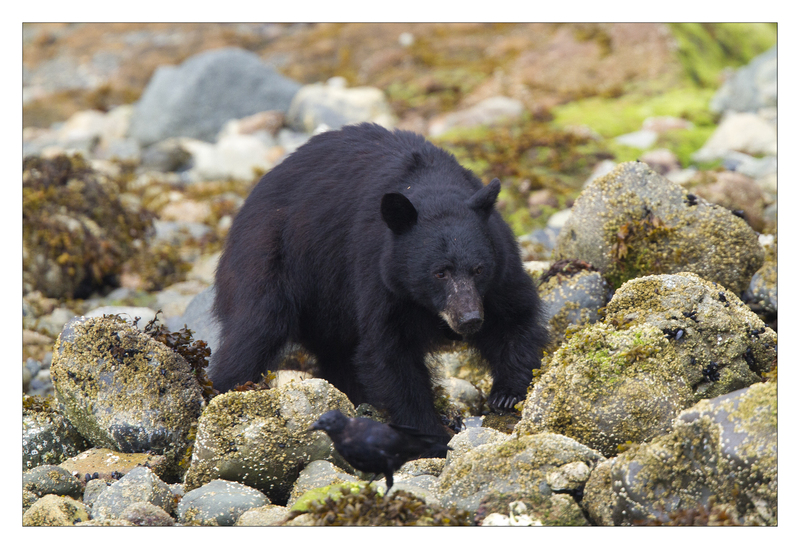 Black bears are fairly common in these areas and we were privileged on one or two occasions to see one scuttling along the sides of the roads. 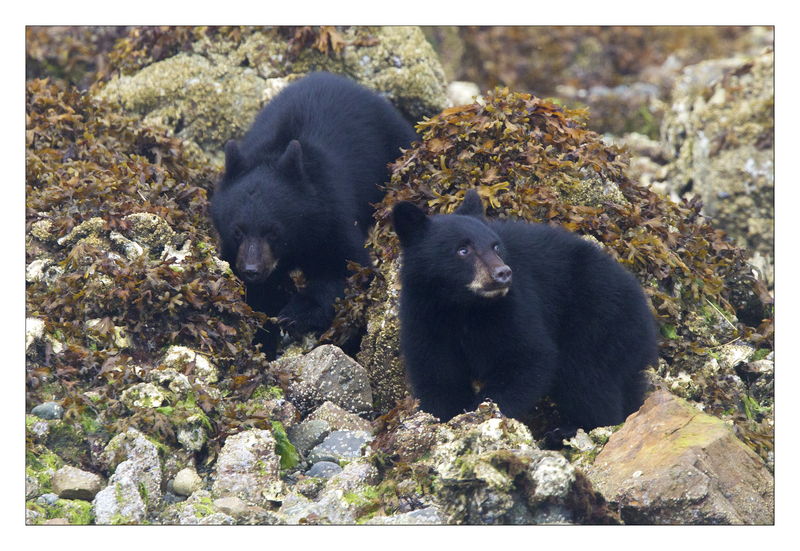 We did however also take the chance to go ‘bear watching’ whilst on the island and again, from a sheltered RIB we were able to grab some intimate moments as first a male bear and then a female and two cubs scoured the shoreline in search of hidden culinary delights under rocks and in little pools. Although we were relatively close to these wild animals they seemed to be totally undisturbed by our presence and continued feeding long after we were gone. Once we had reached the north west and Port Hardy and Port McNeill we decided to embark on a short ferry trip to another much smaller island called Cormorant Island and visit its small harbour area called Alert Bay. This is a wonderful piece of unspoiled ‘1st Nation’ island that takes you back in time to perhaps an era when life was much more simple but maybe harder and tougher. Amongst the working fishing vessels lay older wrecks and long since dilapidated piers leading to a decaying house on stilts. The area was rich for photographers and just the bay area alone could have kept me occupied for a few days. The two shots here show the diversity on offer but the island seemed kind of sad and although very friendly, you feared the population had seen much better, more prosperous days. Both of these shots below were handheld but nevertheless show the beauty in existence for the serious and creative photographer. 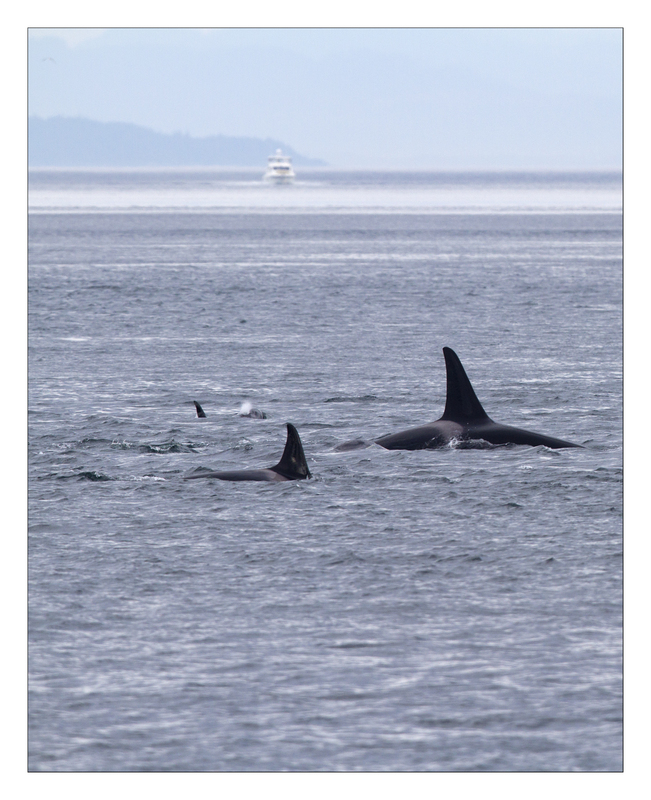 Our stay was drawing to a close on Vancouver Island but the last hoorah was to take yet another whale watching trip, this time aboard a larger vessel, and have yet another opportunity to photograph these beautiful, gentle creatures in their own habitat. The added bonus was to also hear them via a hydro-mic which simply added icing onto an already gorgeous sweet tasting cake! The next instalment will be the continued road trip through the Rocky Mountains for the second half of our trip to Canada.